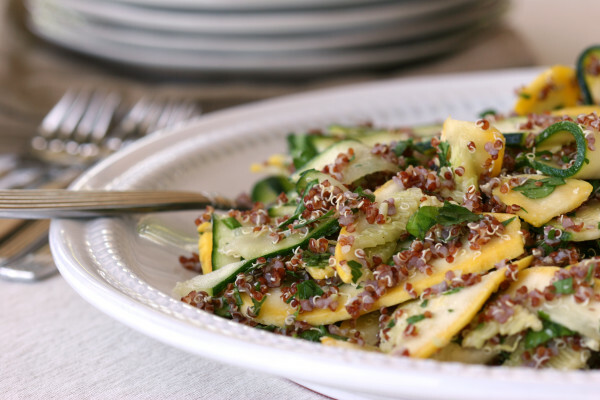 Summer Squash & Red Quinoa Salad :: Picnic Perfect! 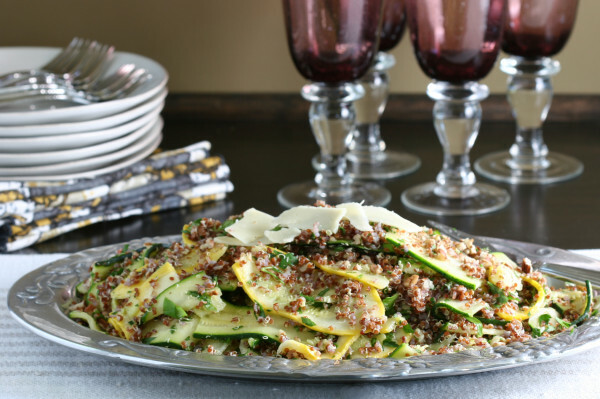 When my friend Kasey served this Summer Squash & Red Quinoa Salad, it was a “get out the cell phone and take a picture” moment. Besides that, it was delicious! I don’t know about you, but by this time in the summer, I’ve had enough potato- or 7-layer salad to last me awhile. I want something different! Mix it up a little! And how about something that’s healthy, fairly simple to throw together, and gorgeous? Is that too much to ask? This salad has become a summer favorite in our house – and it gives me another option for that farmers’ market or garden zucchini. You can serve it as a side or meatless main dish salad. And it’s terrific for lunch the next day. Bring quinoa and 4 cups water to a boil in a medium saucepan. Season with salt, cover, reduce heat to medium-low, and simmer until quinoa is tender but not mushy, 12–15 minutes. Drain; return quinoa to hot saucepan. Cover and let sit for 15 minutes. Uncover; fluff with a fork and let cool. Cut squash into ⅛"-thick slices, some lengthwise and some crosswise. Transfer to a large bowl, season with 2 tsp. salt, and toss to coat. Let sit until slightly wilted, about 15 minutes. Rinse under cold water and drain well. Pat dry with paper towels. 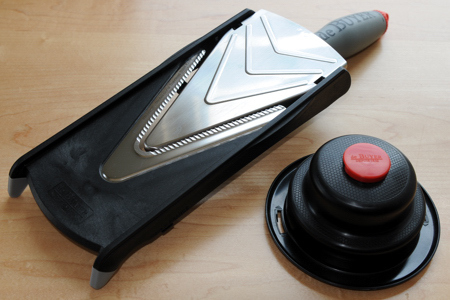 If you don’t have a mandoline, put it on your wish-list! It makes slicing the zucchini (and potatoes for homemade potato chips) super quick and easy. Let me know if you make it, and what you think…! A beautiful addition to a casual buffet. 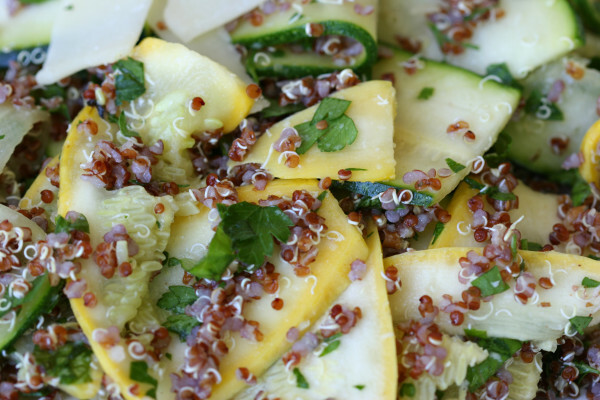 5 Responses to Summer Squash & Red Quinoa Salad :: Picnic Perfect! This was amazing!!!! So nice to switch up the veggie option for our meal last night. Easy to make and everyone loved it. Thanks for the recipe! Isn’t it delicious? Glad you enjoyed it! I discovered this recipe a long time ago, and I’ve loved it for a while. Today I featured it on my zucchni round-up. Thanks for the great recipe! This salad was so terrific – just the right thing for summer lunches. Pefect seasonings and so good to eat! I didn’t have quinoa at home so I made it with cous cous. Will try again with quinoa! Suniti – Thanks for letting me know!! I’m sure it’ll be delish with quinoa too!